Naresh was our Club’s second scholarship winner. 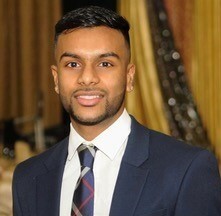 During his undergraduate studies at the University of Toronto, Scarborough, he actively participated in Rotary Club events, and also participated in campus initiatives to support incoming first year students with their transition and academics. In addition, he taught South Asian music at a local community music school and also tutored underprivileged students in his community. Naresh completed his undergraduate degree at the University of Toronto in June 2017 with a major in Human and Physical Geography and a double minor in Psychology and Applied Statistics. His interest in education and the extent to which he actively involved himself in educating and advising students motivated him to pursue a Master of Education degree in Higher Education. He is specializing in Student Services and Student Development at the University of Toronto’s Ontario Institute for Studies in Education (OISE). He will be completing his master’s degree in June 2019. Naresh currently works at the University of Toronto, Scarborough in the Admissions and Student Recruitment office overlooking front line services. He intends to continue working in the higher education field to better support and guide students to reach their academic and career goals. His focus will be underprivileged and visible minority students who face many challenges and barriers within the education system and society. The Rotary Club of Toronto’s Scholarship program has had and will continue to have a very positive impact on the seven young adults who have won scholarships since the 2012 start of the program. The recipients are involved in human resources, labour law, education, computer science, neuroscience, life sciences, business and medical technology. Our scholarship program has made university education possible for impressive young people who might not otherwise have been able to continue their studies due to financial circumstances. The scholarship is open to outstanding students graduating from a Toronto District School Board or Toronto Catholic District School Board secondary school, and who will be attending a College or University in the Greater Toronto Area. To win a scholarship, of up to $10,000 a year for four years, they have to demonstrate financial need, academic excellence, leadership, school involvement and community service. In addition to the financial support we provide, one member of the Scholarship Committee takes on a very important and gratifying mentorship role for one of the scholarship winners throughout their undergraduate years. The mentor is a liaison between the student and our Club, assists with the transition from high school to post-secondary education and is an ongoing resource to the student. The mentor also helps the student get involved with our Club projects and events, such as Youth Day, the Children’s Christmas Party and the recent RI 2018 Convention.